AndyC started a thread HERE a while back about building an AR Pistol chambered in .300 Blk. On page 3 of that thread, one of our members showed a picture of his .300 Blk “pistol”, that had a rifle stock mounted on it, with the explanation that he got tired of having to disassemble the AR to put it in his backpack. That is what I was referring to. My son has the nearly identical setup, with the same stock. He had to register the lower for an SBR and get the stamp. BTW, he worked for a NFA dealer for a while and knows what he’s talking about. Only difference is, his is chambered in 5.56, with a 7” barrel. Also, I forgot to mention that my son built his from a previously-unused stripped receiver set, so it started life as a 7” SBR. You can put one of those cute little stocks on a 16” carbine all day long, and all you’ve got is a carbine with a cool stock. Put one on a pistol lower with a barrel of less than 16” in length, and you now have a short barreled rifle (SBR) — Per the ATF. All SBRs require registration with ATF and payment of a $200 tax. If the above pictured receiver was originally built into a pistol, then the firearm may be converted to a rifle of 16” or longer barrel; and it can later be converted back into a pistol. If the above pictured receiver was originally built into a rifle of 16” or longer barrel, then the rifle can never be converted to a pistol. HOWEVER, it can be registered as an SBR, and then the owner is free to put any length barrel on it he wants to. If the above pictured receiver was originally built into a pistol, and the owner attaches a rifle stock but changes nothing else, he/she has made an unlawful SBR, UNLESS the receiver has previously been registered for an SBR. This is in reference to your email (below) in which you inquire about the legality of affixing an original or reproduction shoulder stock to a Model 1896 broomhandle semiautomatic pistol. Your email was forwarded to the Firearms Technology Branch (FTB) for reply. A rifle having a barrel of less than 16 inches in length is a firearm as that term is defined in Title 26, United States Code (U.S.C. ), Chapter 53, § 5845(a)(3). If a pistol were possessed with an attachable shoulder stock, the combination would be a firearm as defined. Weapons of this type are subject to the provisions of the National Firearms Act (NFA). Mauser, model 1896 semiautomatic pistol accompanied by original German mfd. detachable wooden holster/shoulder stocks, all semiautomatic German mfd. variations produced prior to 1940, any caliber. Further, ATF has determined that such firearms are curios or relics as defined in Title 26, Code of Federal Regulations, Part 178, § 178.11 and, therefore, would still be subject to the Gun Control Act of 1968. ATF has previously determined that Mauser Model 1896 pistols with reproduction stocks, which duplicate or closely approximate the originals, have also been removed from the provisions of the NFA. Copies of the Mauser pistol using frames of recent manufacture, with shoulder stocks, are still subject to the NFA. If an individual possesses a pistol and shoulder stock combination that has not been removed from the provisions of the NFA, the combination would constitute a firearm subject to the provisions of the NFA. The fact that the stock was not attached to the pistol would have no bearing on this classification. We trust the foregoing has been responsive to your inquiry. If we can be of any further assistance, please contact us. I don’t know if this ruling also applies to pre-war Hipowers with accessory shoulder stocks. It’s a ridiculous distinction, but don’t blame me. I didn’t write the stupid law. The PDW stock on the above pictured weapon was designed to be shouldered. Indeed, it would be extremely impractical to use as a brace. Therefore, putting a PDW stock on an AR pistol of barrel length less than 16”, immediately converts the weapon to an SBR. If you don’t have a stamp, you risk 10 years in federal “pounding your behind” prison. Is it worth the risk? Not for me. 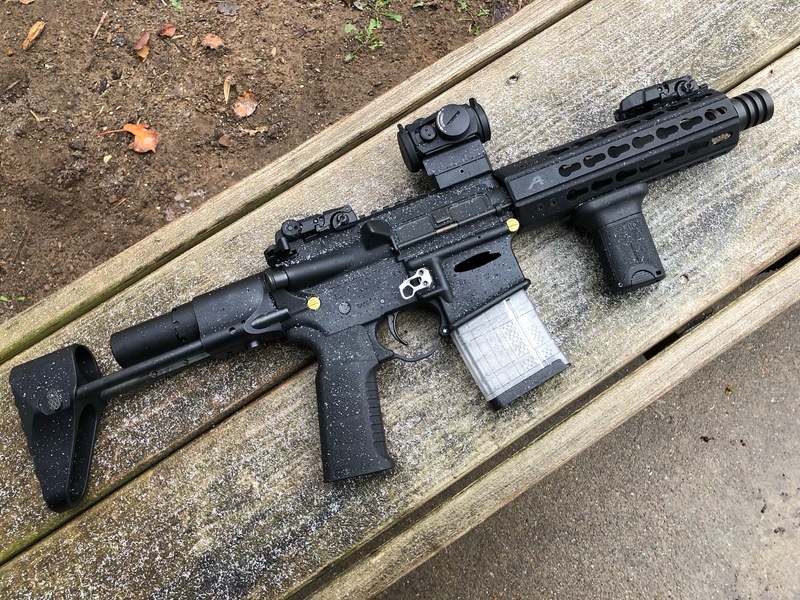 I like most everyone on this forum, and I respect most of your opinions, but if you put a PDW stock on a weapon that started life as a pistol, with a barrel of less than 16” - without registering said weapon as an SBR - you’re playing with fire, and my best advice would be, don’t do it. Hopefully, the owner of the above AR with the PDW stock actually does have it registered for an SBR, and no harm no foul. But I thought it was REALLY important to make sure that other respondents in that thread understood the distinctions, so as to avoid legal troubles. That PDW stock is a nice (if, IMHO overpriced) piece of kit. I wouldn’t mind having one myself. But you can be dang sure I would never put it on a pistol without first registering it as a SBR. I will edit this post as I find out more information. And like I said, I’m happy to be corrected, if you can provide either letter of the law, or official ATF opinion/clarification letters. I’d RATHER be wrong about all of this, but I fear that I am not. Edited to add: it has been brought to my attention that the above PDW stock is in fact a brace, and marketed as one. Chalk it up to bad eyesight. (I am having my cataracts removed in May. ) Never the less, the above content is a caution to anyone who would go through this process to make sure and get it right. Last edited by The Annoyed Man on Mon Mar 19, 2018 1:02 pm, edited 1 time in total. I'm not familiar with the receiver extension accessory on that particular AR. If the manufacturer has a determination letter saying it's a brace, not a stock, then no foul. Are you sure that is a rifle stock? From the pictures it looks a lot like a Sig Pistol Brace, which the ATF has concluded to not be a rifle stock. If there is no ATF ruling on this specific brace / stock / whatever, then like you said, it comes down to the intent of the designers. So the manufacturer's web site and marketing would be key in making the determination, I believe. Soccerdad1995 wrote: Are you sure that is a rifle stock? From the pictures it looks a lot like a Sig Pistol Brace, which the ATF has concluded to not be a rifle stock. If there is no ATF ruling on this specific brace / stock / whatever, then like you said, it comes down to the intent of the designers. So the manufacturer's web site and marketing would be key in making the determination, I believe. That is my son’s 7” SBR in 5.56, with a PDW rifle stock from MVB Industries on it - not a brace, as in the previous image. So like I said, I stand corrected on the original image (bad eyesight), but this is still important info for anyone considering an AR based weapon with a short barrel. The Annoyed Man wrote: Edited to add: it has been brought to my attention that the above PDW stock is in fact a brace, and marketed as one. Chalk it up to bad eyesight. (I am having my cataracts removed in May. ) Never the less, the above content is a caution to anyone who would go through this process to make sure and get it right. The Sig collapsing 3-position pistol brace is even more stock like than the SB PDW brace. Cracks me up every time I handle one for a customer. I used to be able to say that a stock is always better than a pistol brace. But we're quickly approaching a point where these newer designs are narrowing the gap (gap measured in features x $200/time). At some point ATF will draw a line, or worse yet re-draw a line. In a world in which ARs with bump stocks are reclassified as machine guns, you can take it to the bank that it’s a matter of time before pistols with braces get reclassified as SBRs. I don’t think that’s a reason not to get one; I’m just putting my natural pessimism about gov’t’s lack of appreciation for individual liberty on display for you all to enjoy. If that comes to pass, then you might as well spend the $200 and upgrade from a brace to an actual stock. The braces might be pretty usable as a stock, but I’m betting that an actual stock is still a better solution. I think, and I might be wrong, part of the confusion of pistol to rifle vs rifle to pistol is, when these laws were made, there really wasn't a "modular" way to make those changes without it being permanent. To make an SBR/SBS, you sawed off the barrel. It was permanent. So going from a rifle to a pistol is "permanent" in the eyes of the NFA. Now, with a platform like the AR15, you can bounce between the 2 in a matter of seconds . . . which really highlights the obsoleteness of the laws. I'd hate for the ATF to realize it.